One of the biggest questions for support brace wearers is, “how can I clean my brace?” Cleaning your support brace can be a difficult process especially with so many different types of materials. Here at MMAR Medical we understand that this can be a problem, and we want you to get the most out of your support brace. Whether you’re cleaning your knee brace or shoulder brace the following article will give you some cleaning tips to have your brace smelling new in no time! Using normal cleaning products is not recommended when cleaning your sport braces. The normal cleaning solutions can cause the materials in the support brace to weaken and provide less protection and strength. The following solution is relatively simple, but it will remove the smell from the brace without risking the support. Fill up a bucket with the warm water and add the soap. Once the soap has been added, add a little more water to cause the soap to mix and create bubbles. Make sure you don’t add too much soap so that it won’t stay in the fabric and irritate your skin. Take the wash cloth and rub down the metal and scrub the fabric to remove all visible dirt. When all the excess dirt has been removed, submerge the support brace in your container of water. Leave the brace to soak for roughly an hour. After this time most of the smell-causing bacteria should be removed. Always hang dry your support brace. It is suggested that you hang dry in the sun, but make sure that you don’t leave the brace in direct contact with the sun for too long. If you can’t hang dry you can also place the brace on a towel and let it air dry. Drying should NEVER be done in the dryer. This can cause weakness in the fabric. If your brace has metal parts make sure to apply a small amount of lubricant to the hinges to ensure that they continue to bend smoothly. When cleaning your brace follow the instructions carefully. Keeping a close eye on how long you soak it and keep it in the sun is crucial to maintaining a strong brace. All of our sport braces at MMAR Medical are the highest quality but should be cared for carefully. 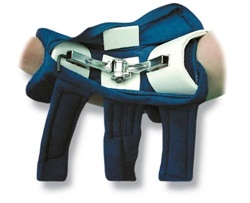 If you have any questions regarding a knee brace, shoulder brace or any other of our products, please contact the MMAR Medical team and we’ll help answer them right away!